Baking by ifood.tv - The Baking channel offers hundreds of Christmas baking recipes, including Christmas Cookies, Snowball Cookies, Mini Brownie Christmas Trees, and Homemade Fruit Cake. iFood.TV - On this channel you will find five categories of videos devoted to Christmas: Christmas Appetizers, Christmas Mains, Scrumptious Christmas Desserts, and Mouth Watering Christmas Cookies. You'll find several ways to cook a holiday ham, plus many less-traditional choices. For dessert, try the classic Christmas cookies or the eggnog cake. The Outdoor Cooking Channel - If you prefer to get out of the kitchen and do you cooking outside, The Outdoor Cooking Channel has a Holiday Outdoor Cooking category. You'll find several videos on creating the perfect holiday turkey, including Smo-fried Turkey, Violated Beer Can Turkey, Citrus Smoked Turkey, and plan Smoked Turkey. If turkey's not your thing, you'll also find instructions for Smoked Standing Rib Roast and Twice Smoked Holiday Ham, along with sides and desserts that include Acorn Squash Grilled Pumpkin, Holiday Turkey Gravy on the Grill, Dutch Apple Dessert, and Four Easy Holiday Pie Recipes Cook Outdoors. Betty's Kitchen - This true home chef, whose husband works the camera, will give you a good number of excellent ideas. Make Easy Holiday Truffles, Baked Country Ham with Brown Sugar-Pineapple and Betty's Christmas Wassail. Drinks - We haven't forgotten to include some adult beverages in our holiday guide. The Drinks channel includes a Christmas category with selections that include Boozy Eggnog, Holiday Party Champagne Punch, Watermelon Candy Cane Cocktails, and Blue Christmas Cocktails. 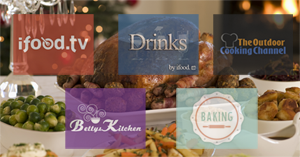 Those are just five Roku cooking channels offering cooking ideas for this holiday season. You're sure to find a lot more Christmas ideas in the many channels available in the Food food channel category.